If you want to know how to run an efficient, hi-tech, virtually frictionless border - come to Norway. At least, that's what Norwegian Customs would have you believe. But this country also has advice for the UK about making its border run smoothly after Brexit - it's about collaboration, not just technology. Norway, which is not a member of the European Union, has a thousand-mile frontier with Sweden, the EU's longest land border. The Norwegians are part of the European Economic Area, meaning they enjoy tariff-free trade, but they still have to mount customs checks at the borders. "I don't think there's any border in the world that's so smooth," says Kristen Hoiberget who runs the customs operation at Svinesund, one of a dozen border crossings that freight companies are allowed to use. He says the average waiting time is eight minutes. There has been a major investment in technology to make things run more smoothly. That includes IT systems allowing goods to be declared to customs before they leave the warehouse, and a sophisticated communications network - Nordnet - that allows the 1,300 customs officials to co-ordinate the policing of such a long border. Then there are four giant scanners that x-ray the lorries picked out for inspection, checking for contraband. In a warehouse at Svinesund, I'm showed the results: crates full of mainly Polish beer and vodka, destined for Norway, where alcohol taxes are sky high. There is also a sack of potatoes - there are strict controls on movement of food and agricultural products across the border. Up in the control room, officers are looking at screens showing cars approaching the dozens of unmanned border crossings, including one quiet country road between Sweden and Norway that I had driven along the day before, without spotting that I was being monitored. They are using an automatic number plate recognition system (ANPR) that throws up alerts if a car is uninsured or is on a database for some other reason. Right now, ANPR is used to spot suspicious vehicles rather than for customs checks. The long-term plan is for it to be integrated into customs clearance so that trucks carrying goods that have already been declared online can simply be waved through without stopping. Kristen Hoiberget reckons that in five years time, 70% of the lorry drivers coming through here might not need to speak to anyone when crossing the border. For now, there is still plenty of paper to be processed, first with the customs agents, then at the customs office. At 3pm, a big crowd of drivers has built up. They take a ticket and wait to hand over their documents. A Swedish trucker grumbles to me that it can take an hour and a half, and he is unimpressed with the level of customer service. But over the years, what has made this border work more smoothly is not just technology but collaboration. 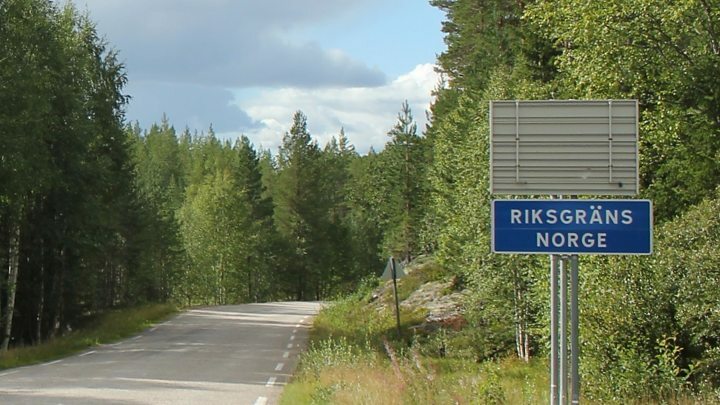 Sweden and Norway have a border agreement that dates back long before the single market. It means that trucks only have to stop at one customs checkpoint, and it gives each country's police force the right to operate up to 16km (10 miles) into each other's territory. One example of this collaboration was on a major fraud investigation, which saw an attempt to import Chinese garlic into Sweden by first taking it into Norway and labelling it Norwegian, avoiding the EU tariff that usually applies. We brought together two customs officers with decades of experience working at the border to discuss what the UK could learn. Anita Graff from Norway and Vidar Gundersen from Sweden now work for a commercial customs agency, but once collaborated on a trial project to use technology to speed things up at the border. "It is possible to set up solutions with smooth border crossings without stopping - the technology is there already," says Anita. She says the UK could get such a system up and running within 18 months. Vidar believes the UK has an advantage because it is starting with a clean sheet. But he says collaboration between countries and businesses is vital: "You have to work on this together and everyone has to see this as a common challenge still to solve." But back at the Svinesund customs operation, Kristen Hoiberget thinks we should not underestimate that challenge. He is dealing with 1,300 lorries a day, while more than ten times as many go through the port of Dover and the Eurotunnel freight terminal. He advises the UK to get a decent trade deal with the EU: "If you don't get any agreement, it's a big problem - everything has to be stopped and you have to declare everything. If you don't have collaboration you will have to stop on both sides of the border and there is a lot of red tape. So I wish you the best of luck!" Whether it is number plate recognition or a driver's smartphone app telling customs everything in a lorry has been cleared, the technology needed to make a border work smoothly is not exactly rocket science. The real challenge is bringing together politicians, customs officials and businesses from different countries to allow it to launch successfully. Can tech solve the Brexit border puzzle? Free trade area, single market, customs union - what's the difference?